The USSR joined the Fédération Internationale de Football Association (FIFA) on 25 June 1946, a year after the end of World War II. The first tournament the Soviet Union national team participated in was 1958 FIFA World Cup Sweden™. Russian football players have been qualified for FIFA World Cup™ tournaments ten times. The best result of the Russian team at world tournaments is the fourth place at 1966 FIFA World Cup England™. 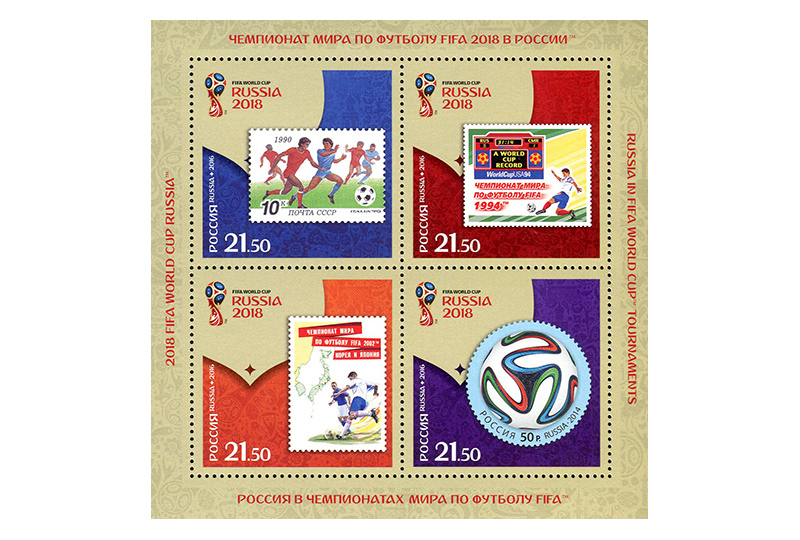 The stamps’ peculiarity is that they bear images of genuinely issued stamps dedicated to FIFA World Cup™ tournaments of 1990 and 2014, as well as symbolic images of state signs of postal payment reflecting the topic of Russia participating in FIFA World Cup™ tournaments of 1994 and 2002. This original artistic solution was proposed to preserve the unifying concept of the issue. The 14th XIV FIFA World Cup™ took place from 8 June till 8 July 1990 in Italy with 24 participating teams playing in 52 games. 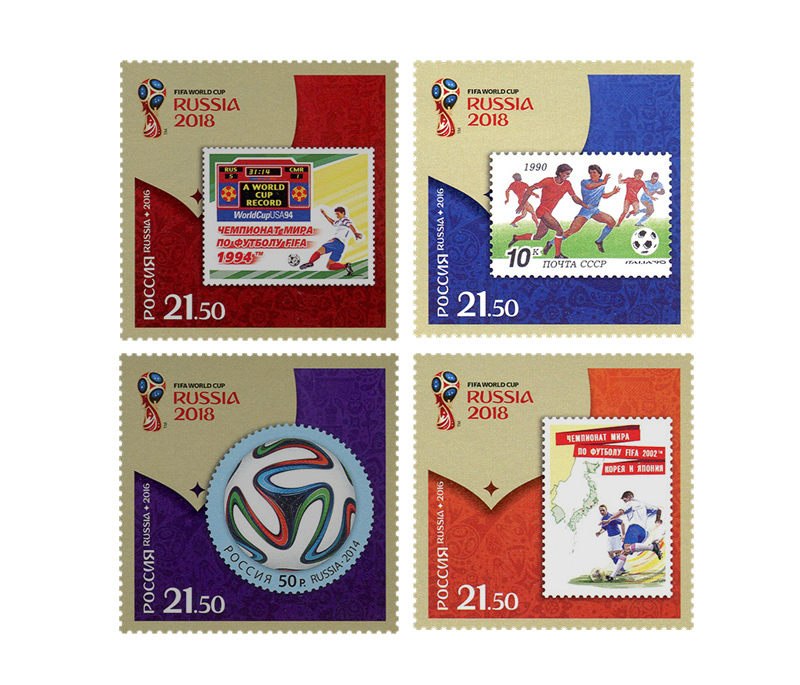 The 1990 tournament was the last one the Soviet national team participated in. The Federal Republic of Germany became the champion winning over the Argentinean national team by one goal. The 15th FIFA World Cup™ took place from 17 June till 17 July 1994 in the United States. It was the last tournament uniting 24 teams, with the Brazil national team emerging victorious. For the first time in history, no goals were scored and the game ended in a draw so that the winner had to be decided in a penalty shootout. The 17th FIFA World Cup™ took place from 31 May till 30 June 2002 in South Korea and Japan. It was the first time the tournament was held in Asia and within the territories of two countries. 32 national teams participated in the tournament and Brazil national team won for the fifth time beating Germany with the score of 2 to 0. The final tournament of the 20th FIFA World Cup™ took place from 12 June till 13 July 2014 on Brazil’s stadiums. The final tournament of the world cup saw 32 participating national teams. Germany became the champion winning over Argentina by one goal.